In the coming days, we’ll be releasing the final details for v2 contract changes. Stay tuned for that post! These releases address several recent concerns around aiding traders and market creators to understand how timezones interact with market end time as well as notice discrepancies between market end time and market details. Additionally, a patch was pushed that fixes a bug users were experiencing when providing initial reporting. 🎏 Includes a more prominent display of when markets end to aid traders in understanding when a market’s definition is potentially invalid due to timezone or end time issues. 🔈 New verification modal dialog gives you better understanding of the market you are about to create. 🐦 Fixes an error users get when initially reporting on a mainnet market. Unfortunately, Chrome broke Ledger support. Users will need to use Opera to use Ledger with Augur. The Forecast Foundation has no role in the operation of markets, trades or actions created or performed on the Augur protocol, nor does it have the ability to censor, restrict, control, modify, change, revoke, terminate or make any changes to markets created on the Augur protocol. The Forecast Foundation has no more control over the Augur protocol than anyone else using Ethereum. Thus, we do not seek to advise others on how to use the protocol. 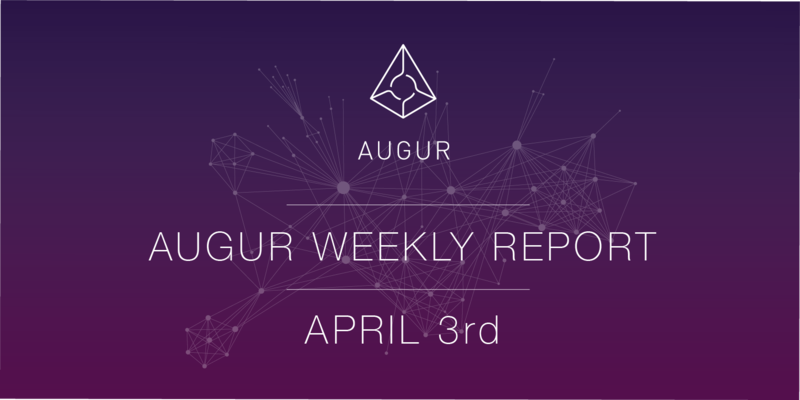 We encourage those in the community that are well educated on Augur to pay it forward and share their ideas for best practices, tips, fixes and etc with the larger community via Twitter, Reddit, Discord, Github and other community channels. For more information regarding the role of the Forecast Foundation, checkout the FAQ. An open-source, decentralized, peer-to-peer prediction market platform built on Ethereum.